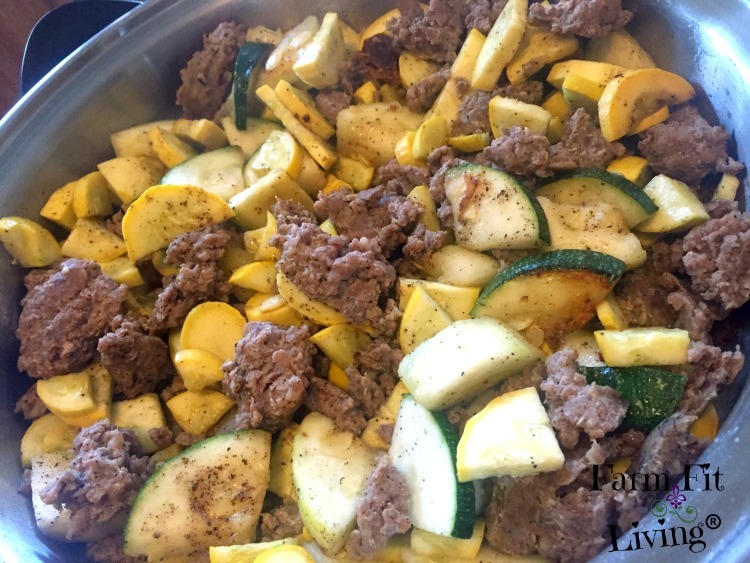 If you need a tasty dish to use up an abundant supply of zucchini and yellow squash, this summer squash sausage skillet is delicious. Summer squash sausage skillet is savory. It’s cheesy. It’s a family favorite for using up summer squash, which seems to keep our baskets overflowing this time of year. Because we all know that once squash takes off, it’s hard to keep up. And there’s a lot of different ways to enjoy summer squash. This recipe for summer squash sausage skillet is one that my mom fixed us growing up. The only thing different with her’s is that she used hamburger. This recipe contains our own home grown pork sausage. My family loved the change up of the pork sausage in place of hamburger. In fact, my husband’s exact words after eating it for the first time was, “This is definitely something we can have again”. Mylee cleaned her plate and asked for more, which doesn’t always happen when it comes to vegetables – especially squash. With comments and results from these critics, you know you have a winner. Plus, it’s paired up with yummy sausage, topped with just enough cheese and cooked slowly in a skillet to perfection. So, what’s not to like about this delectable dish? 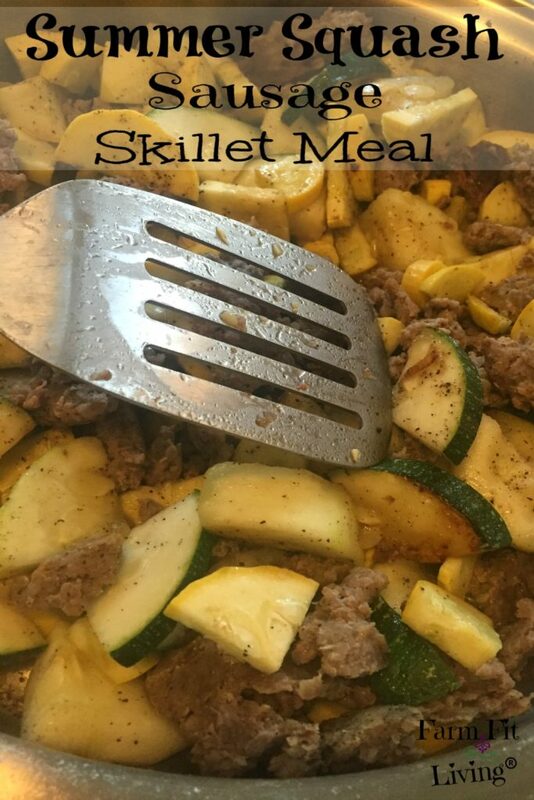 Here’s the scoop on how to make summer squash sausage skillet for your family’s next meal. Coat the skillet with oil or cooking spray and heat the skillet on a medium heat. Brown the sausage completely. Drain any excess grease from the sausage. Chunk the squash into quarter size pieces. Add in enough squash to make an even and consistent mixture with the sausage. Allow the mixture to cook together, stirring occasionally. Add the Italian spices and black pepper anytime while the skillet meal is cooking. Keep in mind that your pork sausage contains spices when adding more. 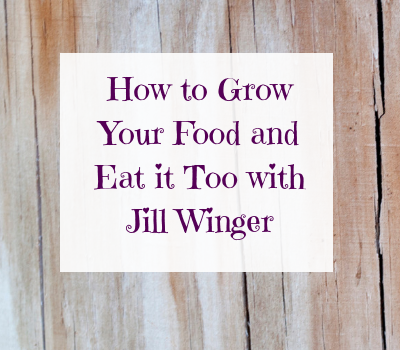 You don’t want to overpower the meal, but you do want to give it enough taste. You know the meal is cooked when the squash is nice and soft. So, now you can add in the cheese. Sprinkle cheese over the top until mixture is completely covered. Then fold the mixture as the cheese melts into it. Add more cheese if desired. 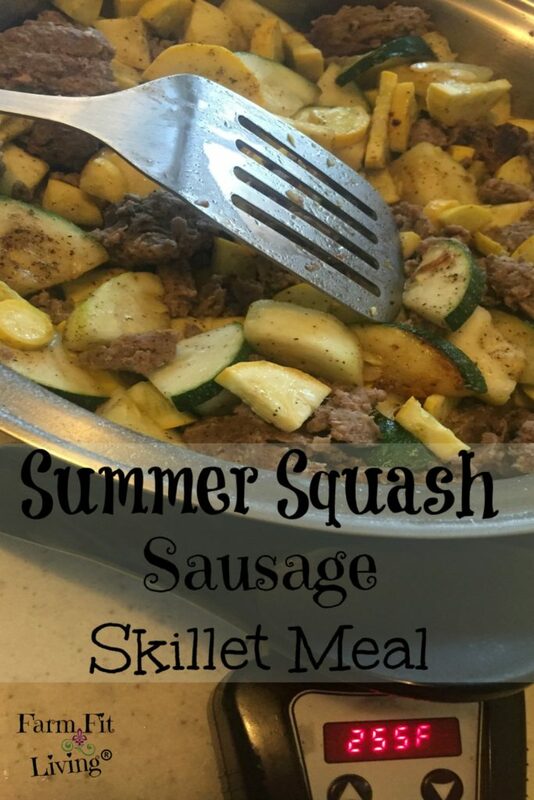 Now, it’s time to enjoy your summer squash sausage skillet meal with your family! We pair it up with toasted and buttered bread or hamburger buns. You’ll also want to make sure everyone has something cold and refreshing to drink while they enjoy the meal. 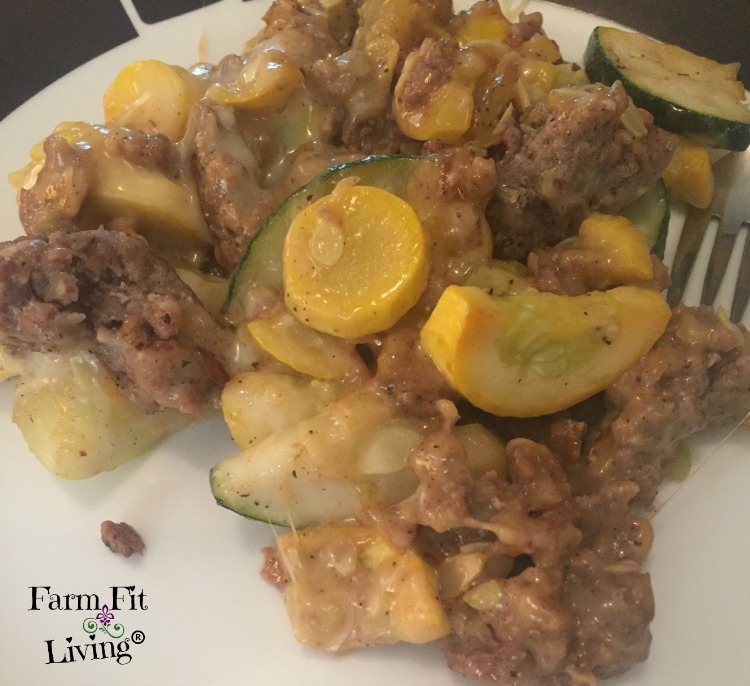 Let me tell you how we grow the farm fresh ingredients to make this delicious summer squash sausage skillet. In our gardening zone of 6A, yellow squash is planted from seed the end of April until June. I prefer to plant mine just after the last frost, which is “usually” the middle of May. This time allows squash to be ready to pick for our county fair the first part of August. I plant about 4-5 hills of yellow squash into black plastic mulch for weed control. The main care for these plants include watering while they are growing and also while the buds are developing. You’ll see gorgeous yellow blooms under the large umbrella leaves. The blooms produce the squash. I like to harvest squash when I notice the bud on the end has died. This produces a medium sized veggie that results in the best color and flavor. Another dish I make with yellow squash include yellow squash bread. Like zucchini bread, it’s a sweet quick bread that makes a deliciously moist snack or breakfast. I also just like to slice the squash and boil it. Then, topped with cheese, it makes a delicious side dish. Yellow squash is also delicious when paired up with it’s cousin: The zucchini. What’s not to love about zucchini? You know how versatile this veggie can be. And how nutritious it is. So, I make sure I grow plenty of it and use it all up. Growing zucchini is just like growing yellow squash. I plant about 4-5 hills of zucchini in May and care for it by making sure it has plenty of water. Look for the beautiful buds and you’ll find baby zucchini. Also a medium sized veggie, I harvest it when the bud on the end of the zucchini vegetable has died. This usually produces a medium sized vegetable great for any dish. Like most people, I love zucchini bread! Shredded zucchini is awesome for shredding and freezing to use up later. It tastes delicious when paired with savory pork sausage in dishes like summer squash sausage skillet. Raising pigs for meat is a fun experience! If you have a small space for a couple of pigs and you love sausage and bacon, I highly suggest feeding a few pigs out for freezer pork. Because there’s nothing more rewarding and satisfying than raising and eating your own meat. It does take quite a bit of work. But I don’t think of raising pigs as work at all. It’s fun. We get the pigs from a friend who farrows them out. They are about 40-50 pound pigs the first part of May when we go to pick them up. They’re weaned and already eating feed. Once we get them home, we get them set up in their new pen. They are in a dry lot where we can provide mud for them during the heat of summer. We also make sure there is an available water source nearby because pigs require a lot of water. Then, we just have fun with the pigs all summer long. Every day chores include rinsing the pigs with cool water from a garden hose, filling up their mud pool, checking their feeder to make sure it has plenty of food and filling their water barrel. During chore time they run through the water and play games. It’s very entertaining. We also give them treats, such as summer squash. Another way pigs go with summer squash is because pigs eat up any unwanted veggie remains, such as skin and ends. Finally, when the pigs reach about 300 pounds, they’ve reached the end of their life. They are ready to be harvested for our freezer. In a sense, we’ve cared for them and now they are going to care for us by feeding us. In the fall, the pigs are taken to our humane and safe local locker plant friends to harvest our pigs and make delicious sausage. We enjoy this sausage all year long, including in the end of summer with summer squash sausage skillet. Using farm fresh summer squash and sausage is part of the reason this dish is so fresh and delicious. As sweet summer time comes to an end, summer squash sausage skillet marks the beginning of starting to think about savory fall. Season the dish just how you like it and you’ll have a skillet meal that will rock the socks off every member of the family. Sausage lends such a delicious flavor to ALLLLLL veggies! This skillet is a huge winner in my book! Absolutely! It is delicious and a winner with a picky group of veggie eaters, too!